Mapquest or Google Maps or GPS? Sure, PAO’ers have internal navigation that negates our need for “maps” and “GPS” and stuff like that. Its nothing new – and one of the many reasons why you guys follow us so dearly. MapQuest lives on due to bringing in cowboy, indian, ninja, and pirate scab labor. Boycott MapQuest now! “cowboy, indian, ninja, and pirate scab labor”?!?!? Is that a poor attempt at humor or just a seriously wrong guess? Mapquest does employ a very small India-based team that works on small projects. The vast majority of their development, qa, and other technical resources are based in the Denver, CO HQ and the Lancaster, PA, technical center. 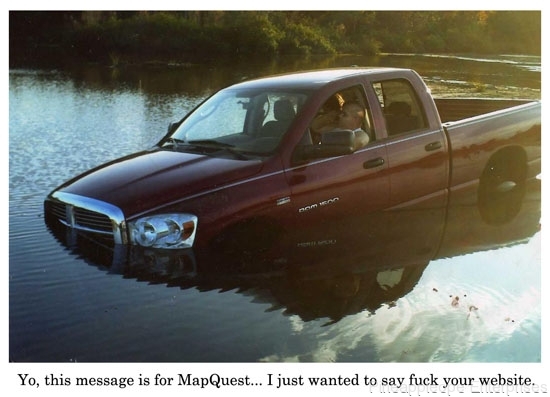 Mapquest lives on due to the fact that there are plenty of people who prefer it’s interface and it’s accuracy. Jeez well I have used MapQuest to go from Lancaster to Denver and in between I found myself in Casper, Wyoming. When I use google maps my progress is three or four times quicker, and I generally end up passing through more interesting locales with more liberal prostitution statutes. Clearly, Google is better. Previous PostPrevious Post #229: Watch out.